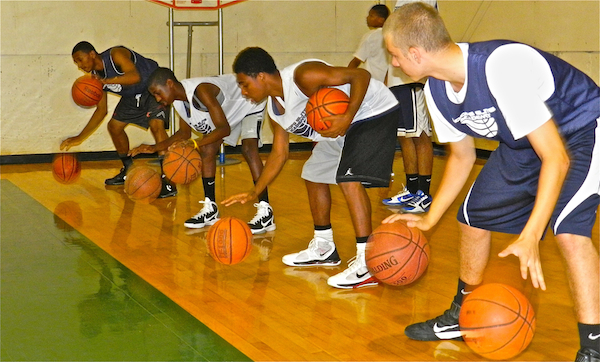 Established in 2011, Hoops Elite Academy runs basketball camps and clinics for Junior Elite players. We combine a rigorous academic program with an elite level of basketball competition. Our mission is to assist young basketball players in accomplishing academic success, developing necessary basketball skills, and creating opportunities for exposure, in order for them to reach their goals as athletes. Each summer, HEA host the top Junior Elite players in New England, and is an annual destination for the top prep schools in New England to recruit perspective student-athletes. Hoops Elite Academy Elite Week is a skill development camp with an exposure component. We use proven skill development, and basketball specific strength and conditioning methods from some of the greatest minds in the game. Our staff has the experience necessary to prepare young players to compete at the high school and collegiate level of competition. Most of our coaches have played basketball at the collegiate level. In order to maximize opportunities for exposure, HEA offers a chance for our student-athletes to be featured in player previews, event recaps, player profiles, mixtapes, and yearlong coverage on our website. Hoops Elite Academy provides its student-athletes who participate in Elite Week with SAT prep, social media training, NCAA eligibility requirements, and the NCAA recruiting process. Elite Week’s curriculum is designed and implemented by experienced educators. Student-athletes, who have participated in our Elite Week event, represent the top players in New England entering grades 6-10. Many of our alumni compete in the NEPSAC, which is considered by many to be the most competitive prep school basketball league in the country. Our alumni attend some of the top prep school programs in New England including, Beaver Country Day School, Buckingham Browne & Nichols, Commonwealth Academy, Cushing Academy, Hillside School, Marianapolis Preparatory School, Noble and Greenough School, St. Andrew’s School, St. Mark’s School, Suffield Academy, Tilton School, Vermont Academy and Williston Northampton School. In just two summers our alumni have earned a number of both team and individual accolades including 36 total division 1 scholarship offers from the A10, ACC, Big East, Big 12, Horizon League, MAC, Metro Atlantic, Northeast, Pac 12, Patriot League, and SEC.